Livewell Southwest joined local partners in Plymouth to launch the latest of the city’s planned 12 Wellbeing Hubs. 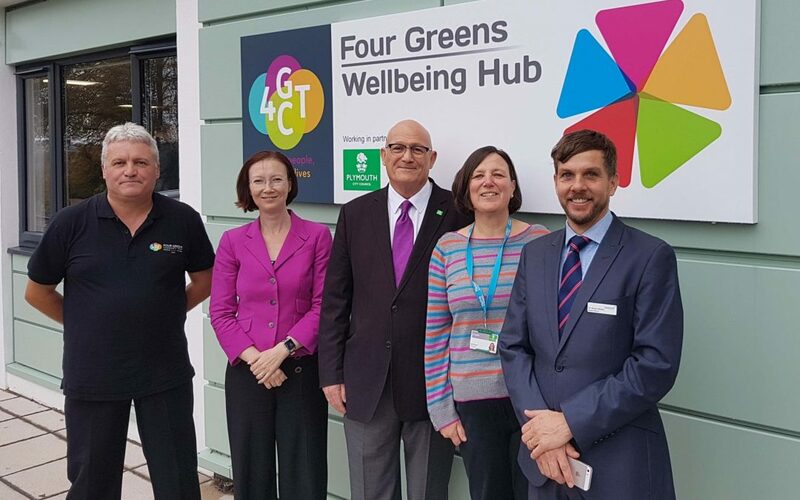 The new Four Greens Wellbeing Hub was officially launched by partners including Plymouth City Council, NHS Northern, Eastern and Western Devon Clinical Commissioning Group, and the Four Greens Community Trust, which is hosting the Hub. The launch comes just a week after a visit from Claire Murdoch, National Director for Mental Health at NHS England, who visited the city’s first Wellbeing Hub at the Jan Cutting Centre for Healthy Living, run by the Wolseley Trust. A dozen Wellbeing Hubs will open across neighbourhoods over the next two years as part of an initiative designed to focus on prevention and make services easier to access in neighbourhoods. The Wellbeing Hubs scheme has four main aims, which are to improve the health and wellbeing outcomes for local people, reduce inequalities in health and wellbeing, improve people’s experience of care and improve the sustainability of the health and wellbeing system. One of the key services the Wellbeing Hubs will provide is social prescribing, for when people have an issue that is affecting their wellbeing but don’t require medical help – this could be problems with loneliness, debt, relationship difficulties, and many other issues.